Wintertime fits Bruges like a well-tailored coat. In these months, the city is threaded with twinkling street lights, shop windows fill with wooden toys and paper-thin glass baubles, and the market square makes way for a luminous ice rink flanked by timber stalls selling spicy mulled wine and tartiflette from giant bubbling pans. Front doors are marked with wreaths of holly and orange peel, horse and carriages clop through the cobbled streets and the candles of the waterside taverns flicker in the surface of the canal. Gable-stepped houses in reds, oranges and greens are tucked up beside Georgian townhouses with bicycles leant up against them (unlocked, we’d like to think). 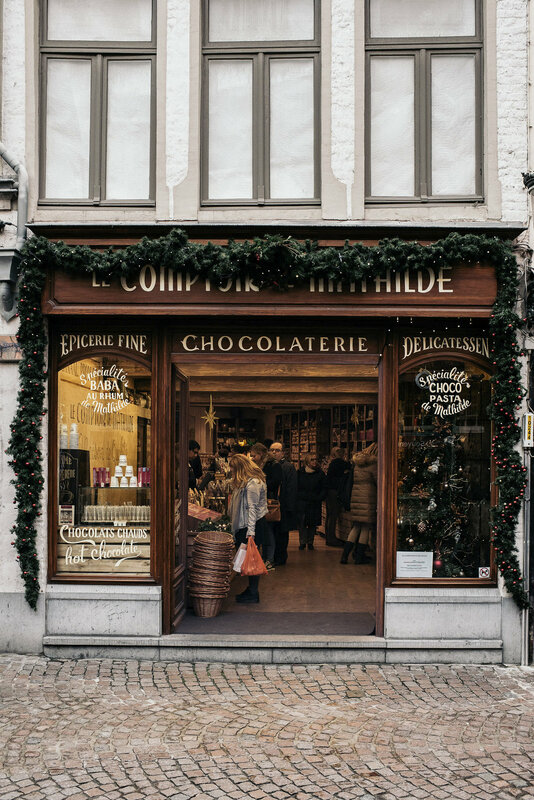 Chocolate, which is still one of the city’s greatest exports, is found in shops dedicated entirely to the craft: bottomless drawers of cocoa-dusted truffles; decorated slabs of milk and dark; sticks of solid chocolate ready to be dipped in to steaming cups of hot milk. Boats chug down the canals, skimming past flocks of snowy swans, and the hours are measured by the clanging medieval bell tower. The air at this time of year smells perpetually of melting chocolate, fresh waffles and cinnamon. And if this all sounds a little twee, that’s because it is. 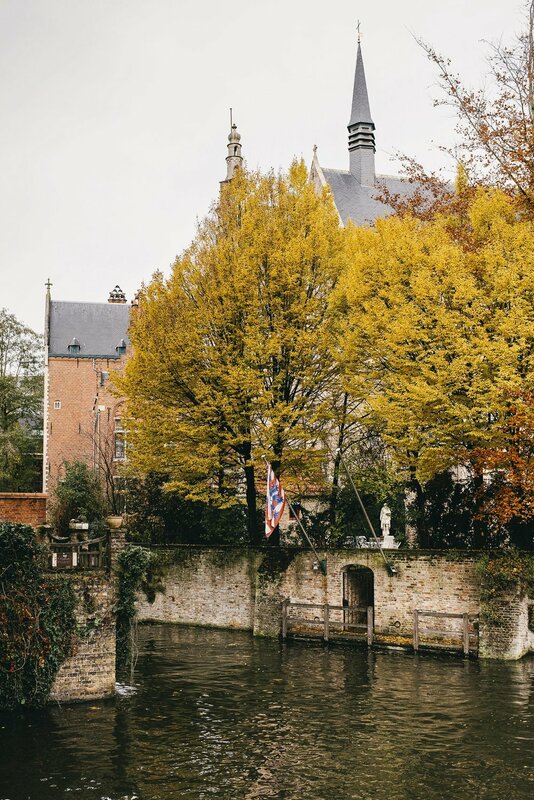 Bruges is a slow, peaceful city, drenched in history and tradition. It is developing at its own steady pace, a creative energy humming beneath its snow-globe exterior. While Bruges has long been respected for its fine dining, it has only recently begun to bud into one of Europe’s key destinations for food lovers. The culinary traditions of Belgium live on in the clattering bowls of mussels, gamey stews, local beers and freshly baked breads available on every corner. 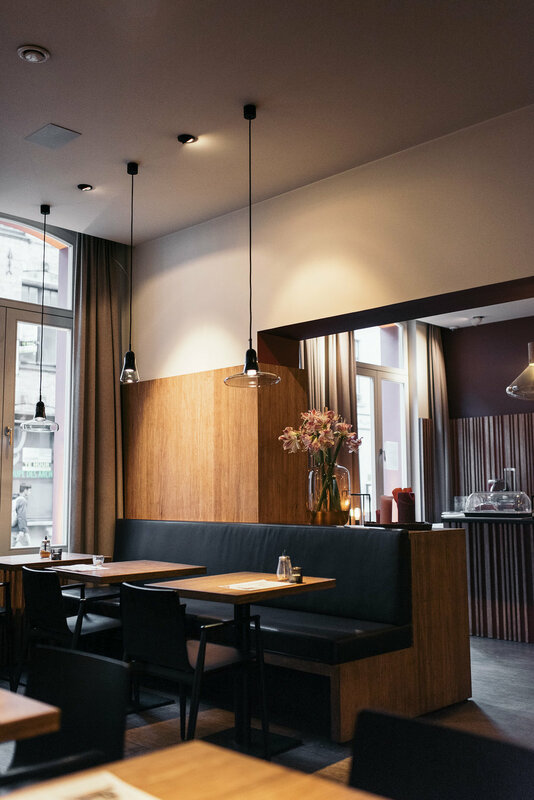 But behind the narrow alleys and creaky doorways, Bruges’ best restaurants celebrate local ingredients, reinventing traditional recipes with a modern, unstated flair. Here, ‘seasonal eating’ is not a trend but a rule. When we visited this November, dishes were being piled with slow-cooked game, root vegetables, purple-tipped tongues of chicory, stone fruits and rich stocks. Cold, creamy oysters could be eaten fresh at the market, while red wine as dark as chestnuts was being washed down with every meal. A serious contemporary art scene is springing up beside Bruges’ classic, world-renowned galleries, which house the oily flesh and velvet of Hans Memling and van Eyck to the surreal landscapes of Rene Magritte and Salvador Dali. Pockets of live music can be found all over the city, from world-class festivals to acoustic gatherings in hole-in-the-wall pubs. There are a few coffee shops that wouldn’t look out of place in Copenhagen, and a craft scene that specialises in artisanal homewares, lace and leather. The best way to get under the skin of Bruges is to walk. Strolling from one side of the centre to the other takes about twenty minutes, but there is plenty to see (and eat) in between. As tiny as it is, you might just find you lose yourself in it. We made Hotel Marcel our home for two nights, bedding down in its cloudy linens and using the woody, fire-lit bar area as our base. This boutique hotel is nestled right in the heart of Bruges, just a chocolate truffle’s throw from the main square and surrounded by some of the city’s most vibrant streets. Breakfast here is a fantasy-quenching menu of steaming hot chocolate, pastries, gingerbread and charcuterie. Weight gain is an essential part of the Belgian experience. So just throw on a roomy coat and go with it. Bruges has long been admired as a fine dining destination, and the same classic restaurants that have topped lists for decades can still be found churning out delicacies to rooms of white tablecloths and champagne on ice. But the more interesting restaurants exist on the fringe of the scene, with ambitious chefs playfully exploring the local produce. Bistro Refter’s interior is washed in comforting shades of burnt orange, with slick furniture, charcoal ceiling lights, a leafy tiled courtyard and an open kitchen at the back of the room that glows and flickers like a wood-fired oven. The menu is rooted in classic Belgian fare, shaken up with contemporary twists. It is run by the same group as the three-Michelin-starred De Karmeliet, but has carved out a reputation for itself with inventive comfort food at less bank-shattering prices. Along with a bottle of bone-dry white wine, we feasted on citrus-spiked soft shell crab, snails and buttery scallops in a sharp herbal soup followed by dark, plummy pheasant with a champagne jus, sour berries and cloud-like whipped potatoes. Refter has achieved that rare balance of luxury (top quality ingredients, impeccable service, fine wine) and comfort (generous portions, informal surroundings, zero judgement for ordering a second bottle of fine wine). We strolled home along the canal with the taste of champagne and cranberries on our lips. The water was lit by lights dripping off the trees. It suddenly felt a little like Christmas. Creamy, freshly shucked oysters are served from wooden pallets at the Vismarkt, a stretch of stalls beneath a stone colonnade arcade built in 1812. From the icy counters, you can pick up meaty prawns, fresh water fish and Belgium’s ubiquitous moules – which you can eat at almost all of the small, candlelit cafes around the city, drenched in white wine and served with fat fries. Belgium’s beer has just been added to the UNESCO World Heritage list, making it mandatory to be sipping a frothy glass mug of the golden stuff at almost every hour of your trip. Bonte B, like most of Bruges’ gastronomic gems, is unassuming from the outside. But behind a carved wooden doorway, one of the city’s most beautiful dining rooms lies in wait. Like entering the living room of some elegant Scandinavian relative, Bonte B is lit by two huge windows, which look out over the leaning brick houses opposite. The bleached wooden floors are laced with cowhide rugs, while Danish chairs are tucked neatly beneath tables of glinting silver cutlery, fresh flowers, flickering candles and polished wine glasses. The food, which is arranged over carefully-constructed tasting menus, champions seasonal, local food bursting with colour. Every plate is as stylish and artfully-constructed as the last, but head chef Bernard Bonte never chooses style over substance. On our afternoon in the warm grip of this place, we ate delicate plaice with crumbly quinoa and yogurt cream; softly yielding guinea fowl with glistening Belgian endives and earthy mushrooms; raspberry mousse with clementine jelly and lime herbs; oaky white wine and bitter espressos served with homemade lemon meringue pie bites. We arrived at lunchtime and left just as dusk began to set it, turning the room cool blue. We hadn’t looked at the time once – food this good has a habit of making you lose track of the world outside. It takes a bold man to name a restaurant after one dish. But after visiting this stylish spot, it makes complete sense. Head chef Jürgen Aerts’ famous Coq au Vin is, frankly, perfect – soft, tender chicken that falls off the bone into a well of rich, deep sauce, served with hopelessly creamy mash. The dish is timeless and honest, a little like the restaurant itself, which is adored by locals, who stroll here at dinnertime arm-in-arm down Ezelstraat, just over the canal. The colour palette is muted, with soft grey seating, charcoal booths and pale floorboards, and Jürgen can be seen in the open kitchen, working fervently on dishes of fresh fish with blanched vegetables, grilled langoustines, lemony ceviche, venison with truffles or pork cheeks with lentils. Perched in a small paved square with an intricately-carved fountain at its centre, Vero is a café to linger in awhile. In good weather, locals spill out of the glass-fronted entrance, sipping frothy coffee or homemade ice tea in the sun. Inside, the exposed brick walls are licked with white paint and leafy plants. Natural light fills every inch of the room, dappled across the monochromatic stone floors. Along with their own pies, crumbles and buttery pastries, Vero does a mean cup of coffee, changing their supplier each week. Head to the bright back room to flop down on the sofa with a book (fine, an iPhone) and a cup of sweet muscat made with nutmeg and vanilla, or a slow brew filter coffee strong enough to have you skipping down the cobbled streets all afternoon. At weekends, locals head to The Gulliver Tree, an airy café of soft sofas, bursting bookshelves and great food, with a roaring fireplace at its centre. As well as single-origin French press coffee and meticulously-sourced teas, breakfasts here are hearty affairs; bowls of fresh fruit, homemade granola, pastries, smoked salmon, eggs, fresh juice and crusty bread with smooth, highly addictive Belgian chocolate spread. 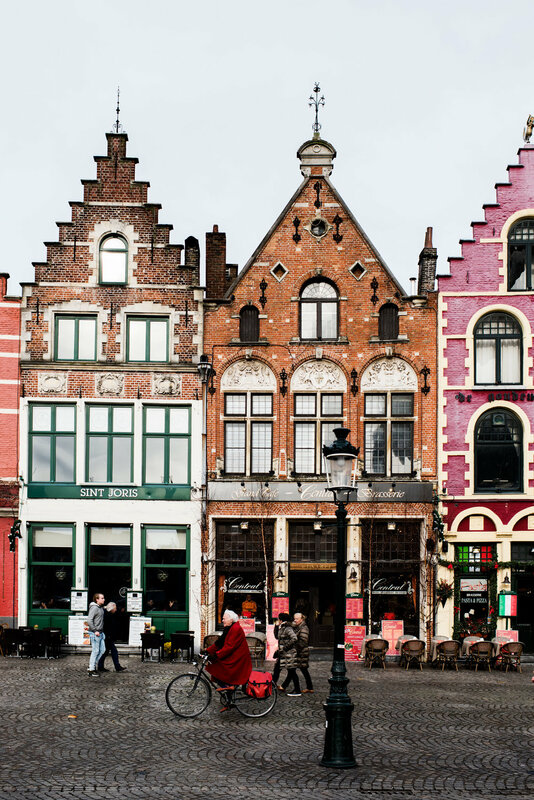 For all of its fairy-tale-esque turreted buildings, cobbled bridges and weeping willows, Bruges has its fair share of cutting edge stores selling the kind of aspirational wares you’d expect to find in Copenhagen, Amsterdam or London. We dipped into Depot D’o on more than one occasion, with its tropical taxidermy, tribal art and off-the-wall antiques. We ran our hands over the hefty oak tables and peered at kaleidoscopic butterflies in glass domes at Vie de Vue, a vintage shop just off the canal belt. Ester and Bob are the interior designers behind Goûts et Couleurs, a concept store with the kind of streamline furniture, geometric materials and buttery cashmeres that make you resent your home and everything in it. And if it’s books you’re after, Bruges is bursting with them. Find classics and endless shelves of travel guides at De Reyghere, the city’s oldest bookshop. For rare finds head to the flea market along the Dijver, and for music, poetry, art and sumptuous coffee table books, try Raaklijn. For a great selection of vintage clothes, belts and shoes, pop in to Think Twice, where Bruges’ cool kids go to source duster coats and silk scarves. Take a leaf out of our book, though, by going before you’ve eaten the entire lower half of a chocolate Santa Claus. Vintage Levi’s are a struggle to get on at the best of times. 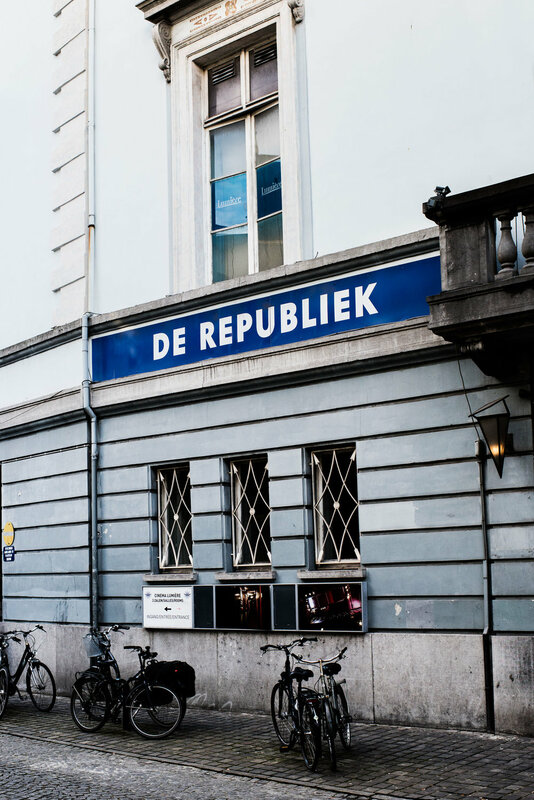 De Republik is the kind of bar/café/independent cinema/event space that everyone wants in their city. The sprawling room is a work of reclaimed wooden surfaces and exposed steel, while the brick courtyard is littered with seating and artworks, laced with lightbulbs. A long, well-stocked bar stretches across the back wall, while young Bruggelingen (locals) sip craft beer and sift through the dinner menu, where local fish, risotto and great burgers come with suggested wines. At weekends, DJs get behind the decks and visitors swap Flemish coffee for mescal, rum and ruby-red Camparis. Bruges is quiet after dark, with just a few glowing bars beckoning you in for a nightcap. Stop off for a drop of the hard stuff at Comptoir des Arts, a bricky little lair that specialises in live blues and whiskey. An impressive line up of heady blues and roots bands fill the calendar at this place, and the chances are there will be something on when you drop by. The whiskey and bourbon selection is dangerously good – the perfect partner to the roaring fireplace and bustling local crowd. Down the road, you’ll find Reisling and Pinot. This simple, cosy wine bar has an open fireplace (naturally), tiled floors and heavy oak beams, giving it that ‘living room’ atmosphere that draws you in and threatens to keep you there all night. The wine list is extensive and comprehensive, and if, like us, you tend to blindly point at the menu, the knowledgeable staff are on hand to happily advise.